In a digital world, most people are concerned with keeping up with their online personas and social media profiles. But what about when you have to meet with someone in person—whether it’s a new client or potential business partner? Sometimes it’s easy to forget the importance of professional hard-copy materials that represent you—the foremost example being your business card. 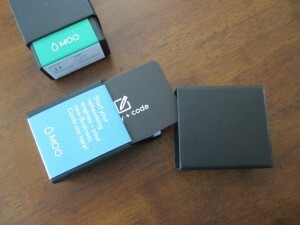 The creative team at Code and Code, a Cleveland-based digital marketing and web development company, recently decided to order some new business cards. The requirements? Something that had a fresh, clean appearance but with a professional flair. In the old days, you would task a graphic artist with creating a business card design that would have to be sent to a printing company. This might require meeting with the designer or printer in person. Then, if you wanted to update the content of the card for additional print runs, you would have to update the graphic file yourself or have the artist update it for you. To streamline this process, we decided to create our new business card design with the help of two companies: Creative Market and MOO. 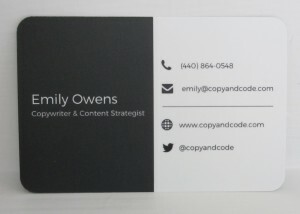 We customized a business card design template from Creative Market, choosing the appropriate colors and font to coordinate with the Copy and Code logo and website. With only a minimal amount of work, you get a hip, unique design that’s yours to keep and update as needed. The second step involved sending the business card file to MOO for printing. The company allows you to print business cards on premium paper with custom finishes. We chose to print our design with rounded corners and a matte finish for a sleek, contemporary look that resembles a small deck of playing cards. We highly recommend working with these vendors to produce high-quality print products and look forward to using our new cards to connect with new digital marketing and web development clients.